UPDATE: Wow, my sister already made her goal thanks to you guys. Good work! Thanks a lot! I'll try to post all the poems I owe you all by the end of the day. Hey guys, I hope this isn't too spammy, but my awesome little sister needs some help. She has to get 120 people to answer this short survey about their experience with using Amazon (.com, .ca, .whatever). If you've used Amazon in the past year and you have 5 minutes to spare, consider taking it. There's no prize at the end, but if you report back here, I'll write you a short little poem or a haiku or something. Thanks a bunch! 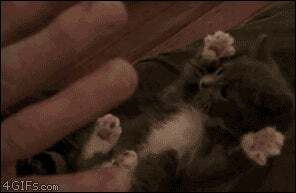 Please enjoy this kitten gif for your trouble.